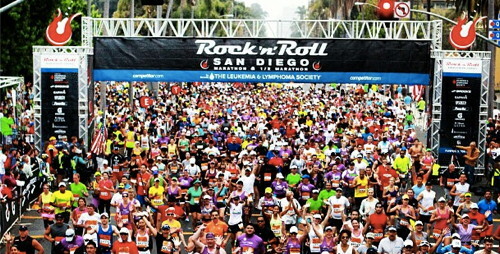 The Rock ‘n’ Roll Marathon and Half Marathon in San Diego is the original, and in many ways is still the signature event of the RnR Series. I’ve been there every year it’s been held so my history and the event’s history run in parallel. Since it’s in San Diego the stars of the running community tend to come out. This weekend I was on stage with Jim Ryun, Rod Dixon, Steve Scott, Meb Keflezighi, Josh Cox, and Deena Kastor. Talk about an all-star line up. The Sub-4 Seminar with Jim Ryun, first high-schooler to run a sub-4 marathon and STILL the only high school junior to ever run under 4 minutes, Steve Scott, who has run more sub-4 minute miles  than anyone in history, and Rod Dixon, who has run 53 sub-4 minute miles and – oh by the way – later won the New York City Marathon was fascinating. I asked the each to describe how they would have raced – and beaten – the others if they could have raced at the height of their careers. It turns out that Dixon was a strength runner and would have pushed the pace early to gain an advantage, Ryun had an amazing 400 meter kick and felt that if he was close he could go by on the last lap, and Scott was just really, REALLY good at racing the mile. Meb is moving back to San Diego, from Mammoth, to be closer to family and to co-own running specialty stores in the city. He also didn’t competely dismiss the idea of another shot at an Olympic team. Josh is – well – Josh. He is one of the brightest, most affable athletes I have even known. He gives great information in a way that easily understood by the average athlete. It’s always fun to sit on stage with him. But it was Deena that left me with a thought that will haunt and inspire me for some time. She told the story of her coach telling her before a big race to simply “define yourself.” Define yourself. What a formidable task, for a runner and for an individual. How do we define ourselves in small and large ways every day? Are we impatient with people? Are we impatient with ourselves. Are we forgiving? Do we ask more of ourselves than is necessary. Do we care, love, cherish the people who care for, love, and cherish us. I know that the original context for Deena was that particular race. In talking to her, though, it became obvious that she has reflected on the question on her life as a woman, a wife, a mother, and an athlete. Too often, I think, we tend to see great athletes like Deena as being only that; an athlete. What I learned from Deena is that whether we are at a starting line, deep into a difficult race, or standing in line at the grocery store, we have the opportunity all day, every day, to define ourselves. And that knowledge, more than talent and dedication and speed, is what makes Deena Kastor a champion. UPDATE: I should have known. As I said, it’s like the first microwave. Now that I have books to listen to, guess what? I listen to them every chance I get. I listened on the plane flying to San Diego – and back. I listen while I was relaxing after the race. I even listened while I was falling asleep – which – is VERY cool to have someone read you a bedtime story when you’re 64 years old. John, thanks for these words, they’ve helped put things in perspective this week. Ryan and I hope to run into you soon at an RNR race.